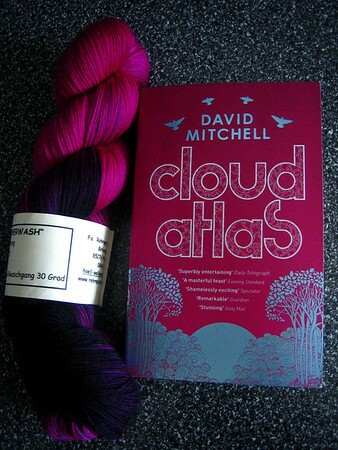 I read a recommendation of Cloud Atlas by David Mitchell somewhere online as good modern science fiction, but I can’t remember where I saw it. The book has some fantastic writing, and in my typical manic fashion I mark the page numbers of my favorite quotes with a pencil at the front of the book so I can read them later. p. 96 – She’s a born physicist with a better head for mathematics than I ever had, rather to her mother’s chagrin. So I won’t give away the book’s clever structure entirely, but it isn’t completely science fiction, in fact the science fiction chunk is the smallest. That, however, didn’t deter me from devouring it chapter by delectable chapter. p.52 – So I sat at the Bosendorfer and played the syphilitic crank Three Blind Mice, after the fashion of a mordant Prokofiev. This entry was posted	on Wednesday, March 14th, 2007 at 12:04	and is filed under books. You can follow any responses to this entry through the RSS 2.0 feed. You can leave a response, or trackback from your own site.